Purchased. Registered File number 1993/263. 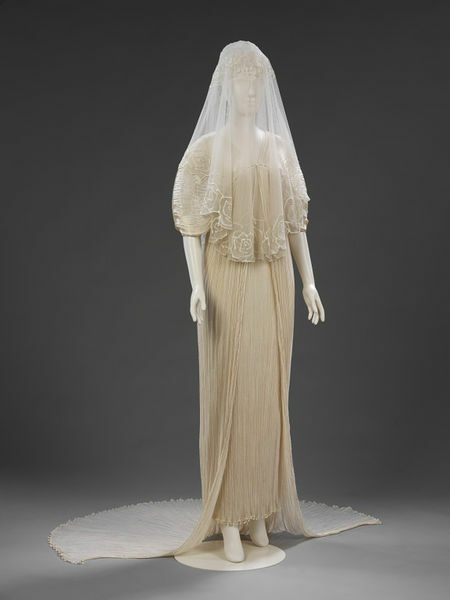 Wedding dress and veil, pleated silk and silk net with rubber decoration, designed by Ian and Marcel; pair of shoes by Hannah Goldman for Ian and Marcel, 1989. This outfit by Ian & Marcel uses impressive craftsmanship to merge tradition and innovation. 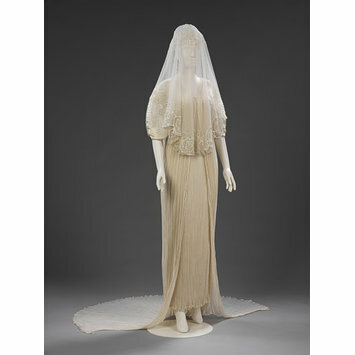 The dress and coat pay homage to the hand-pleated silk garments created by Spanish designer Mariano Fortuny (1871-1949) but conform to a more contemporary silhouette. The bride wore them with a veil, but instead of a wreath the designers drew a circlet of roses in silicone rubber on the veil's surface.